When action code errors occur that Tinderbox wants to bring to your attention, an orange marker is shown in the top left corner of the Text pane's title bar. There is no exact listing of what triggers a listing, but primarily the feature exists to flag up unparsable agent queries and action or similar rules and edicts. The pop-over shows a list of error items. Each item describes and error and then path of the note to which it refers. If an error is resolved, e.g. 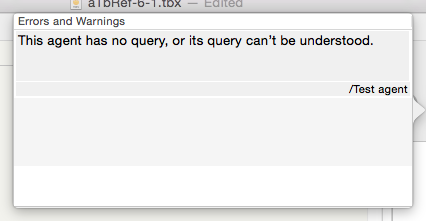 a broken query is fixed, it is removed from the list. If the entire error queue is emptied the orange marker is removed. Double-clicking on an item causes it to clear from the list, which is useful if there are several entries or if the user wishes to ignore the error and not be reminded.